The first diagnosis to determine infertility was made 4,000 years ago, an ancient Assyrian clay tablet discovered by Turkish researchers in central Kayseri province revealed Thursday. Various researchers from different universities led by Şanlıurfa's Harran University examined a 4,000-year-old Assyrian tablet containing a prenuptial agreement and found out that the first infertility diagnosis was made in central Kayseri province's Kültepe district. 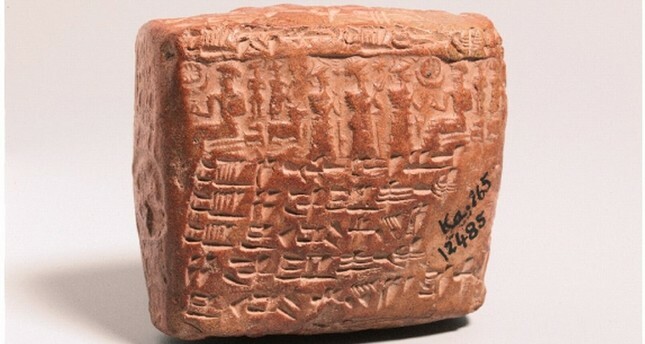 The clay tablet written in cuneiform script discusses infertility and a solution for the issue, which is the inability of a person to reproduce through natural means. Professor Ahmet Berkız Turp from Harran University's Gynecology and Obstetrics Department told NTV that the clay prenuptial agreements addressed the issue of infertility in Assyrian families. Accordingly, the wife would allow her husband to hire a hierodule - a female slave brought in to serve as a surrogate - if the couple failed to conceive a baby two years after the date of marriage. "The female slave would be freed after giving birth to the first male baby and ensuring that the family is not be left without a child," Professor Turp said. The results of the research have been published in the medical journal of Gynecological Endocrinology and the tablet is on display at the Istanbul Archaeology Museum. Assyria was a complex Mesopotamian civilization dating back to the 25th century B.C. Kültepe was home to an Assyrian settlement of the Old Assyrian Empire from the 21st to 18th centuries B.C. Over 1,000 cuneiform tablets were discovered at the site in 1925, while modern archaeological work started in 1948.